In an attempt to rationalize and optimize maintenance activities, manufacturing and process organizations are actively deploying reliability-centered maintenance (RCM) programs. The RCM process guides resource allocation decisions to ensure that maintenance activities and reliability goals are closely aligned. 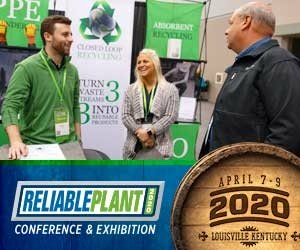 In turn, those reliability goals are aligned with organizational goals such as maximizing profit and shareholder equity, assuring safety, minimizing environmental impact, etc., for optimum operation. An important RCM tool is failure mode effects analysis (FMEA). Unlike failure root cause analysis (FRCA) which is used to analyze failures after the fact, FMEA is a systematic process used to identify potential failure modes and effects before failures occur. In reality, FRCA and FMEA work hand-in-hand. FRCA sets the stage for the FMEA, which in turn produces a plan to deploy appropriate maintenance actions. FRCA alone is limited because failure occurs before it can be applied, proving too costly for critical systems. It is more practical to estimate likely failure modes and sequences in advance, or simulate failures in an experimental situation rather than allowing a failure to occur before a maintenance plan has been instated. MIT emeritus professor Earnest Rabinowitz estimates in his book, Friction and Wear of Materials, that in about 70% of the cases where mechanical equipment loses usefulness, wear out or corrosion is the cause of surface degradation (see Figure 1). Industry experts generally agree that between 40% and 75% of all wear in industrial equipment is in some way related to lubrication, making it responsible for between 25% and 50% of lost usefulness of industrial equipment. Despite the prevalence of lubrication-related failures, the manner in which they are typically documented at the plant is quite casual. For example, sudden volumetric loss of the lubricant caused by a drain plug vibrating loose and the addition of the wrong lubricant into the system might be generally categorized as a lubrication failure. While both can significantly impair lubrication, the mechanisms by which equipment reaches the failed state are not comparable. 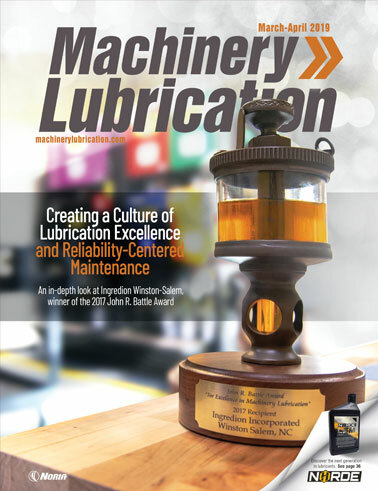 It should also be noted that lubrication failures are often misdiagnosed as bearing failures, pump failures, etc., which are symptoms, not causes. When lubrication is correctly identified as the cause of failure, the nature of the lubrication failure is not clear enough to be useful. FMEA is an excellent inductive analysis tool that adds precision to identifying lubrication failures and enables asset managers to anticipate and plan for them with cost-effective maintenance strategies. The FMEA process is not new. However, it is new when applied to maintenance optimization. The different components and steps of the basic maintenance FMEA process, are described below and illustrated in Figure 2. 1. List the equipment at the system and/or sub-system level. The degree to which one wishes to break the system down depends upon the criticality of the operation. It is generally advised to start at a high level and drill-down as required later in the process. 2. Identify the function(s) served by the equipment in achieving organizational goals. For example, in a stamping operation, a hydraulic press (equipment) must stamp material (function) for the organization to achieve its business objectives. 3. Identify potential failure modes. A pump failure is one way, or mode, in which a hydraulic press can fail to perform its designed function. Typically, too much time is spent differentiating functional failures from technical failures. Stakeholders in the organization often have varying views as to what defines a failed state. For instance, suppose an individual purchases a new sports car that has an advertised top-speed of 150 mph. A visit to a test track by the proud new owner reveals that his vehicle is only capable of reaching 145 mph. Technically, the vehicle has failed. Functionally, it has only failed if traveling at speeds greater than 145 mph is a bona fide requirement for the vehicle. 4. List the potential effects of failure. Different failure modes will have different effects on the organization. If the hydraulic pump craters, the pump ceases to function altogether. If the pump is worn over time causing its volumetric efficiency to decline, the operation may be slowed or it may require more energy to accomplish the same level of work of a properly functioning pump. 5. Define the severity rating. For comparison and prioritization purposes, it is necessary to assign a failure severity rating to each occurrence. This refers to the relative impact of a failure on the operation with respect to downtime cost per hour and expected duration, repair costs, personal injury costs, environmental cleanup costs, etc. The severity of failure is typically scaled on a one to ten basis, with one being the least and ten being the most severe. Each organization will have a unique definition of what is a short or long down period. Generally, serial type operations are more sensitive to downtime than operations where multiple machines serve the same function, and the loss of one machine results in only a fractional loss of production. There are numerous ways to arrive at a rating number for each failure mode, but for industrial applications, the consensus approach has proven to be cost-effective. Figure 3 illustrates a severity rating that is based upon the duration of downtime produced by the failure event. 6. Define potential failure mechanisms. Sometimes called the “forcing functions,” failure mechanisms are why a particular failure mode might occur, or the underlying root causes of failure. For example, the failure mechanism cavitation can produce the failure mode pump failure, which can stop or slow production. 7. Assign an occurrence rating to each failure mechanism. Again using the one to ten scale, (one being least frequent, ten being most frequent), estimate how frequently each failure mechanism is likely to occur. Figure 4 is an example of a system used to rate failure frequency. 8. Identify predictive techniques. Advanced warnings reduce the impact of a failure event by enabling management to schedule downtime, have parts and supplies on hand and line up personnel with appropriate skills to implement corrective actions. List the various techniques by which each failure might be detected. 9. Assign a detection rating to each failure mode/mechanism. Again using a one to ten scale (one being longer, ten being shorter), assess the effectiveness of the early warning systems (i.e., oil analysis, vibration analysis, etc.) used. Figure 5 provides one example of a detection warning period rating table. 10. Assign a risk-priority-number (RPN). The RPN is calculated by multiplying the severity rating times the occurrence rating times the detection rating (Severity x Occurrence x Detection = RPN). The RPN rates the importance of each potential functional failure on a one to 1000 scale, one being the lowest priority and 1000 being the highest. While the technique is pseudo-quantitative, it is systematic and effective for the purposes of comparison and prioritization. Since it is based upon input numbers that are produced using a consensus, the derived RPN is also consensus-based. 11. Identify recommended maintenance action items. Based upon the nature and importance of the various failure modes and mechanisms, the cost to deploy detection techniques and technologies and the RPN, action items are recommended. These items can range from equipment modifications to procedures for inspection. For most mechanical systems, the reliability engineer must define the lubricant as a critical component of the system because no shared-load system or spare exists for the function performed by the lubricant unless the host system is spared. 1. Define the functions the lubricant is required to perform for each machine under investigation (these functions are defined in the Lubrication Functions Table). 2. Identify the lubrication-specific failure mechanism that might impede functional operation of the machine (these failure mechanisms are described in the Lubrication Failure Mechanisms Table). 3. Place an X in those boxes where the Lubrication Function and Lubrication Failure Mechanism intersect for a given machine. For example, lubricant degradation can’t degrade power and work transfer functionality in a bearing oil system because that function is specific to hydraulic machines. 4. 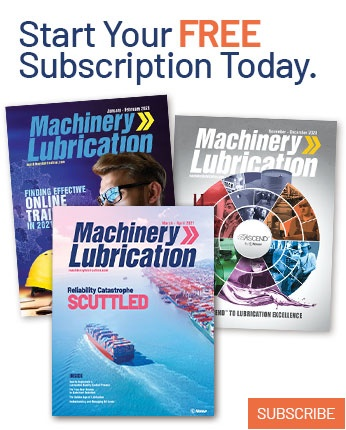 In the Causes, or Failure Mechanisms, identify the specific lubrication related failures that are the underlying root causes of failure modes that lead to a loss of system functionality. For instance, the specific lubricational failure mechanism “particle contamination induced loss of power and work transfer functionality” can cause loss of, or diminished, hydraulic system performance (failure mode) that disable the machine from stamping, molding, etc. 5. Complete the FMEA process as previously discussed. Conclusions The Lube FMEA Worksheet provides the lubrication specialist with a tool to utilize the general framework of FMEA to precisely define lubrication-related failure within the context of a machine’s function and contribution to meeting the company’s business objectives. By eliminating the practice of casually lumping technically unrelated failures into the category of “lubrication failure,” a new level of precision in maintenance and control over leading root causes of failure can be achieved. A related process can be applied to the deductive FRCA process to more effectively define lubrication failures after the fact. That subject will be addressed in another issue of Practicing Oil Analysis magazine. Maintenance (RMC) II, Second Edition, Industrial Press Inc.:New York. Materials, Second Edition, John Wiley & Sons: New York. Equipment FMEA,” Quality Progress, December, pp. 48-52.